The effects of the electric power grid have been compared to the Silk Road and the 19th-century railway system in terms of revolutionizing communications, economies, and societies. Yet in many countries, the power grid is ridden by outages—with results ranging from disrupted work time and spoiled food to heat-related deaths. Utility companies in developed countries tend to use smart meters to monitor household power. These meters take high fidelity measurements and can determine the location and length of outages, but they also can be prohibitively expensive—only about 40 percent of American homes have them. Meanwhile, utility companies in developing countries cannot afford to deploy smart meters and are forced to rely on customer feedback to understand the quality of the power they provide. In 2013, Prabal Dutta, an assistant professor of electrical engineering and computer science at the University of Michigan, and Noah Klugman, then an undergraduate at the University of Michigan, began a series of conversations about this problem with Matt Podolsky and Javier Rosa, two researchers from UC Berkeley’s TIER lab, and Professor Eric Brewer, TIER’s founder. Together, the team set out to develop a system—called GridWatch—that automatically senses and reports power outages and power restorations with high temporal and spatial accuracy. The team also aimed to make the system highly affordable, so that it could be deployed across the globe. One of the GridWatch team’s early insights was that smartphones can determine the presence of power using on-phone sensors. Smartphones were also deemed an attractive solution because of their ubiquity, falling costs, high-resolution sensors, and ability to transmit data over the cellular network. Indeed, GridWatch is a prime example of how leveraging technologies of scale—in this case, the world’s 1.75 billion smartphone users—can yield large socioeconomic benefit at a low cost. By combining advances in machine learning, distributed data-stream processing, and complex network analysis, the GridWatch team seeks to demonstrate that crowd-sourced data streams can leapfrog some of thorniest energy problems in the world’s least industrialized countries. With support from USAID’s Development Impact Lab, GridWatch is currently being designed as a free and open-source mobile app. Its sensing strategy is based on the following: When a phone is charging, the phone is connected to both the power grid and cellular network. When an outage occurs, the phone stops charging, prompting the GridWatch app to take measurements from on-phone sensors, to try to confirm that the phone stopped charging due to an outage and not from normal use. If the GridWatch app senses an outage, it will send a report containing the time and location of that outage to a central server. Finally, software on this server will look for multiple reporting phones and other patterns, to corroborate reports and measure the size of the outage. One advantage of GridWatch is that it does not require any new or expensive hardware. As for researchers, said Podolsky, they will have a data set that was previously unavailable—one that could allow utilities, governments, and citizens to study and improve grid performance and management across different populations, geographies, and time periods. To achieve this goal, the GridWatch team has been working with utility companies in developing countries to identify potential partners to pilot and deploy the app. The team is in active conversations with the Kenya Power and Light Company (KPLC), which sells electricity to over 2.6 million customers, and IBM Research Africa. GridWatch data is appealing to KPLC because it would enable the utility to localize faults and improve efficiency in scheduling maintenance and repair crews. For the GridWatch team, Kenya is an ideal location because the country has wide cellular coverage and an 82 percent cellphone ownership rate. It also has a high frequency of power outages, averaging 10,000 monthly in Nairobi alone. 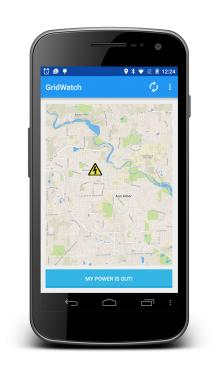 In August 2015, the Siebel Energy Institute awarded a seed grant to the GridWatch team to develop its system. Should the pilot in Kenya go through, GridWatch would be installed on the cellphones of KPLC and IBM Research Africa employees before being rolled out to a wider population. Klugman notes that the GridWatch app is being designed to protect users’ privacy; it allows them to control the specific sensor data shared as well as to view and delete all measurements collected by the app. The GridWatch team expects the Kenya deployment would allow them to answer their first set of research questions and then implement improvements.